The UK energy regulator Ofgem refocused public attention on security of supply last week by projecting a plunge in the power market capacity margin to less than 5% by 2016. The projected risk of major supply disruptions rises accordingly from 1 in 3,300 years today to 1in 12 years by the middle of the decade, or 1 in 7 years if there are further gas plant closures. Ofgem’s analysis has spawned national headlines on the threat of power cuts and blackouts, raising public awareness of these security of supply issues. There can be little doubt that this report escalates the pressure on the government to deliver. The UK energy regulator Ofgem refocused public attention on security of supply last week. Ofgem’s first Electricity Capacity Assesment report projects a plunge in the power market capacity margin to less than 5% by 2016 as shown in Chart 1. The projected risk of major supply disruptions rises accordingly from a 1 in 3,300 year event today to 1in 12 years by the middle of the decade, or 1 in 7 years if there are further gas plant closures. Ofgem’s analysis has spawned national headlines on the threat of power cuts and blackouts. While Ofgem emphasises that its report should be taken in the context of the Electricity Market Reform (EMR) policy work the government is undertaking to address security of supply, it highlights the risks of EMR failure. But it is the resulting increase in public awareness rather than the report’s findings that is likely to have a real impact. There is little doubt that this report escalates the pressure on the government to deliver. What factors may precipitate a more severe and prolonged crunch? What actions may the government take in an attempt to alleviate capacity tightness? We take a look at these two factors below. The approach Ofgem takes to projecting capacity margin looks reasonable. They also recognise the significant uncertainty facing the power market over the next five years and run a number of scenarios in an attempt to determine a range of possible outcomes. 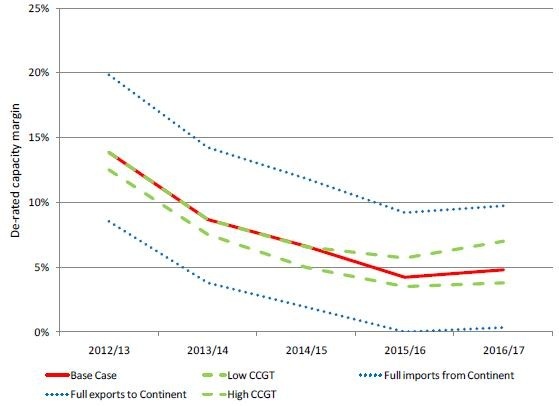 But the factor we think Ofgem has underestimated is the potential for a significant decline in the level of CCGT capacity by the middle of the decade. We have highlighted previously the large volume of CCGT built during the ‘dash for gas’ period in the mid to late 1990’s, illustrated in Chart 2. These plant are approaching an age (typically around 20 years) where substantial capital expenditure is required to extend plant lives. At the same time generation margins and load factors on these CCGT have been squeezed as market spark spreads have compressed. Fixed costs are currently greater than revenue earned on a number of older CCGTs meaning owners are suffering a negative cashflow hit. This is not helped by the increased ‘wear and tear’ and maintenance costs from operating CCGTs at lower load factor. Chart 2: Potential UK capacity closures? Given ongoing energy policy uncertainty, the risk is owners close plant rather than wait for the possibility of a recovery in returns. Ofgem recognises this risk in a ‘Low CCGT’ downside scenario but this only assumes around 1GW of additional CCGT closures. 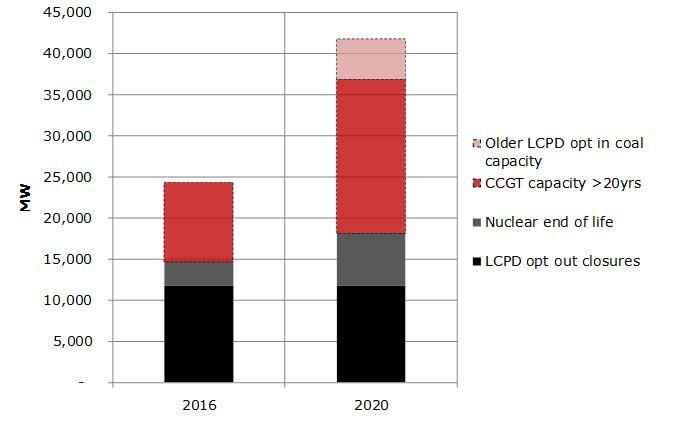 Chart 2 illustrates the volume of older CCGT capacity greater than 20 years of age in 2016. In our view 1GW is an optimistic ‘downside’ scenario and there is a risk that CCGT closure volumes could be much higher, exacerbating the capacity crunch. How may the government act to avert a crunch? The first option may seem the most likely, but an investor considering the development of a new CCGT plant faces a formidable set of challenges. Weak spark spreads, capital constraints and enormous policy uncertainty. Not surprisingly CCGT new build has stagnated and it will take more than directional statements on a Capacity Market to change investor’s minds. Indeed there is little the government can do to address these challenges in time to deliver new plant by the middle of the decade. The risk is that a poorly designed Capacity Market is rushed through, adding to the policy uncertainty. The second option is fading, given most LCPD coal and oil plant will now be closed and stripped down well before 2016. The life extension of nuclear capacity scheduled to close mid decade is a possibility, but the volume is relatively small. That leaves the third option, where the government acts to keep as many of the existing gas plant on the system as possible. We think this is both the most cost effective option and the most likely. There may still be time for the government to achieve this by fast tracking the implementation of a Capacity Market that can support existing capacity. But if the government does not deliver this in time, a similar result may be achieved by the system operator (National Grid) contracting reserve on a bilateral basis. One way or the other, option three looks to be supportive of the value of existing CCGTs.